What is the relationship between plastic cling film and Photoshop? 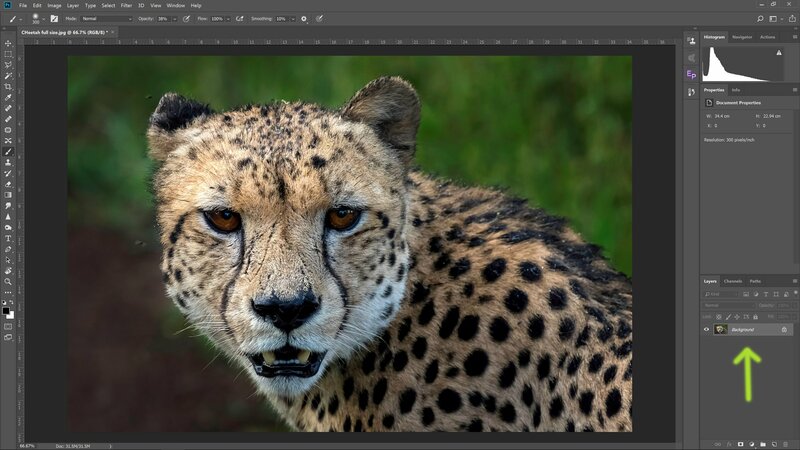 Read all about it in this ‘Working With Layers in Photoshop’ tutorial! Layers are the backbone of Photoshop. They give you the opportunity to edit your photo’s without changing or touching the original image. Without layers, Photoshop would not be able to offer us what it does. What is the use of layers? How do you create a layer? How do you edit a layer? These subjects are just the start of working with layers in Photoshop, but it gives you a solid basis and understanding about layers and working with layers in Photoshop. Let’s go! Ps. if you don’t have Photoshop installed on your computer just yet, you can download it here. A Photoshop Layer is basically the same as pages in a book: 2 or more pieces of paper stacked on top of each other. Photoshop allows you to give each of these pages a specific look (layer effects), and you can decide which part of this page is visible and which part is not. Another way to explain layers is to compare them with plastic kitchen cling film, which you stretch over a photo. The cling film is your layer in Photoshop. If you paint something on the cling film, you do change the way the photo looks, but you don’t actually change the photo itself: you’ve only changed the cling film. So if you don’t like what you’ve painted, you simply throw away the cling film and you’ve got the original photo again, without it being adjusted. This, nothing more, nothing less, is what a Photoshop layer is. 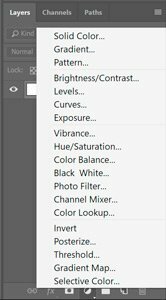 If you open a photo in Photoshop it will be automatically loaded as your base layer, or background layer, in the layer panel on the right-hand bottom of your screen. This layer panel shows you all the layers in the opened document. 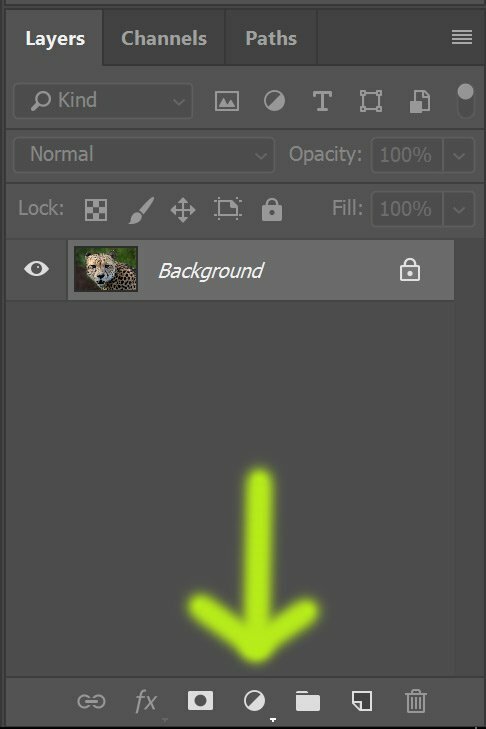 So if you open a photo, you start off with 1 layer: the base or background layer, as shown by the the green arrow in the example below. What is the purpose of layers? The most important purpose of layers is the fact you can make adjustments to your photo, without actually changing the actual photo. We call this a non-destructive workflow. So you make changes to the layer on top of your original photo, and you do not make any changes to the photo itself. Besides adding changes or effects, you can decide where the effect will be visible, and where you don’t want it to be visible. Besides this you can make adjustment, on top of adjustment, on top of adjustment, and be very precise about where you would like the adjustments to be visible or not. Now, there are different ways to create a layer. The most common way of creating a layer is by adding an effect to your photo, via a fill- or adjustment layer. Another way of creating a new layer is by adding a new transparent layer. 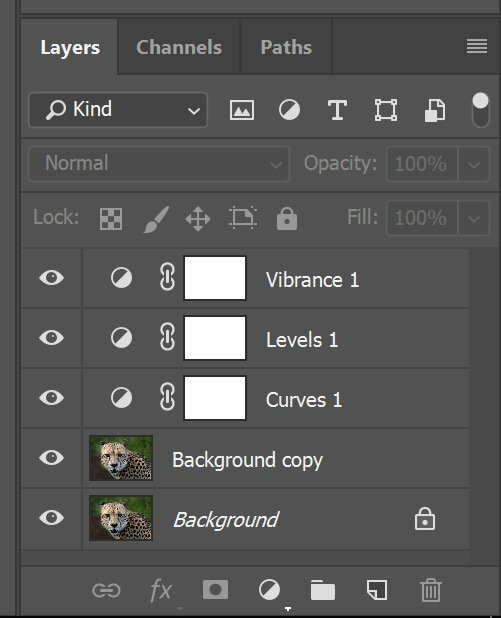 But let’s start with the first one: a fill- or adjustment layer is created by clicking on the round shaped black/white icon in the bottom of your layer panel. Click here to add a fill- or adjustment layer. You will see a menu appear as shown above. If you click on this icon you will be shown a menu with many different layers effects (see above). These effects include for example brightness, vibrance, color balance, level adjustments etc. I will go deeper into each of these layer affects in another tutorial, but for now it is just necessary to understand that the options are there. Just click on one of the options; let’s say the Curves layer. 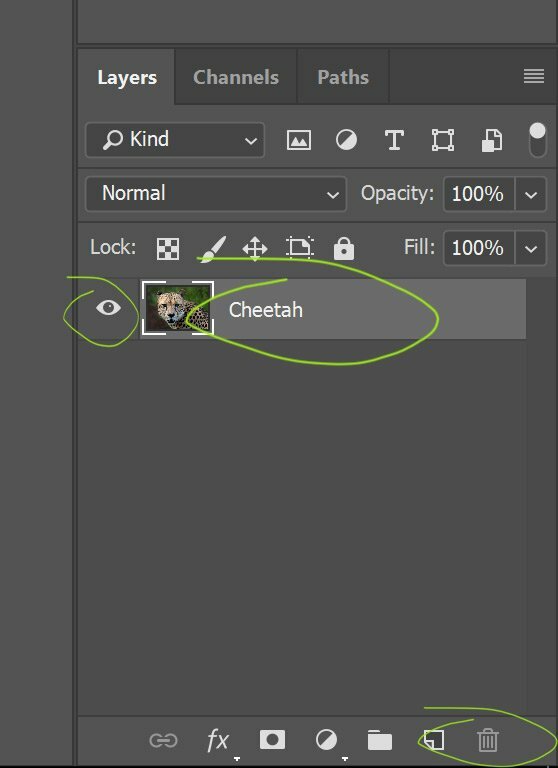 You will see that Photoshop automatically creates a new layer, which will appear above the base layer (or background layer) in your layer panel. If you select this layer by clicking on it, you will notice a properties panel is loaded above the layers panel. Within this properties panel you can set the parameters for the specific selected adjustment layer. For this specific tutorial it is not relevant what this curves layer does, but it is important to understand how to create an adjustment layer and where you can find this layer. However, to give you a bit of an idea: this curves adjustment layer gives you the opportunity to lighten or darken your photo, by dragging the diagonal line within the properties panel up or down. Just play around with this to see what it does, so you get a bit of a feel for it. Again, more details to follow in the next tutorial. The purpose of this way of editing is that you can perform edit on top of edit without touching the original photo. So by adding different adjustment layers on top of your original photo, you can for example change the brightness, the colour balance and vibrance. And, if after all your adjustments, you actually don’t like the brightness adjustment, you can simply delete this layer which directly deletes the adjustment without touching the other adjustments you made. Or, to go back to the cling film: you stretch a piece of cling film over your photo and paint this green. Subsequently you stretch another piece of cling film which you paint red, and last a layer of cling film which you paint blue. Looking at the end result you love the blue and the red, but don’t really like the green. You then simply remove the green layer, which leaves you with the red and blue. It’s as simple as that. If you would have done this without using layers, you would have adjusted your original photo which would heave made it impossible to undo your first adjustment without undoing the adjustments you’d made thereafter. Another usage of layers is by creating a completely empty layer which you can then use to add for example text. You can get this by clicking on the layer icon at the bottom of your layers panel, or by simply clicking on the text icon in your tool bar on the left-hand side of the screen. By using the text tool, Photoshop automatically creates a new layer. Just give it a try, and you will notice a new layer appears in your layer panel on the right. It is smart to name the layer after you have created it, so it stays clear throughout the editing process what that layer does. If you add a new fill- or adjustment layer, Photoshop basically directly names it accordingly. So a curves layer is called ‘curves’. But further down the line you might add another curves layer, which then becomes confusing. So name the layer to it specific purpose: for example ‘curves face’, when you have brightened up a face with this specific layer. By double left-clicking on the name (text) of the layer, it will be highlighted and you can change it. If you have created a layer, but you are not happy with it, you can easily delete it. Right-click with your mouse on the layer, and select ‘delete layer’. Or, even easier, click on the layer and whilst keeping the mouse button down, drag the layer to the bin icon at the bottom of your layers panel. If you want to see the before and after result of a layer, or you want to hide the layer for some other reason during the editing process, you can simply make the layer temporarily invisible without deleting it. Click on the ‘eye-icon’ on the far left of layer in the layer panel. The eye will now disappear, which means the layer is invisible. An empty square will remain in the spot the eye-icon was before. By clicking on this empty square, you will make the layer visible again. 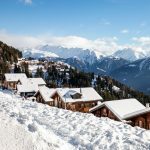 Now you know a bit more about layers, and how to create a fill- or adjustment layer, it is about time to see how you adjust a layer. This however is quite a general and wide subject, because there are thousands of ways to edit a layer. What I mean is: what can you actually do with a layer, after you’ve created it. Editing of a layer is for example changing the intensity of your adjustments by changing the opacity. The opacity is standard set to 100%, but by taking this down you soften the effect of the adjustment layer. In this way you can change your adjustments in a really precise way, even if you’ve created the layer earlier on in the process. Another way of editing your layer is by making only parts of the layer visible, and parts invisible (transparent). In this way you can very specifically tell Photoshop where to apply the layer effect that you’ve created. For example, you can specifically brighten up a face on the photo, without brightening up the back ground. This process is called “Layer Masks”. Think about a fogged up shower cabin or window. The window in this example is your layer, everything you see through the window is the original photo. Say the fog on the window is the effect you added to the layer, but you only want this to apply to a certain area. You will simply rub a part of the window with your hand which makes it transparent, showing everything that is visible behind the glass in that area. In this way the effect is only visible in the area which you haven’t touched. Delete the curves layer by dragging it to the bin-icon. See the video below for an example of this practice. I hope this tutorial has helped you to understand the basics of layers in Photoshop. 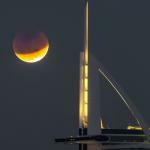 Please read my other tutorials to expand your knowledge about this subject. If you have any questions, please don’t hesitate to contact me here!